After having answered subscribers email questions for more than two years, it occurred to me that many of the questions being asked were originating from a basic misunderstanding of the principles involved in waging the law of one jurisdiction over another jurisdiction. Tightly wrapped up in this problem was the fact that people were entering the court thinking it was a court of law and not some other kind of court (like an administrative proceeding). Administrative courts need your consent (as a member of its jural society) to carry out its duties, and people were understandably confused about this arrangement. They were consenting to the court’s jurisdiction without realizing how that was done. There are several ways that this can occur, and if you are not aware of them, you could end up unintentionally consenting without being aware that you were. Combine that with the fact that the federal government of the United States ceased to be a de jure government in March of 1861, and from that time forward has been operating as a de facto government, declaring emergency after emergency in order to justify maintaining its de factocontrol over governance, and what you have is a lawless and criminal syndicate operating as a legitimate authority in a land where our forefathers declared their freedom and independence from such oppressive government. Now, either you are outraged over this development or you are not. In the case of the latter, you need not read any further or pay attention to anything on this website. In the case of the former, keep reading if you want to find out how to fight back. In Case Study Answers To Frequently Asked Questions, the author has set out to clarify as many as possible of the most frequently asked questions that arise about holding one’s position and status while undergoing the process of defending that position. And this is done within the context of the situation in which the question arose so that readers can begin to think about these solutions on their own. Concordant with this is the need for readers to become clear about asserting the principles of law which are involved in the matters they wish to remedy. 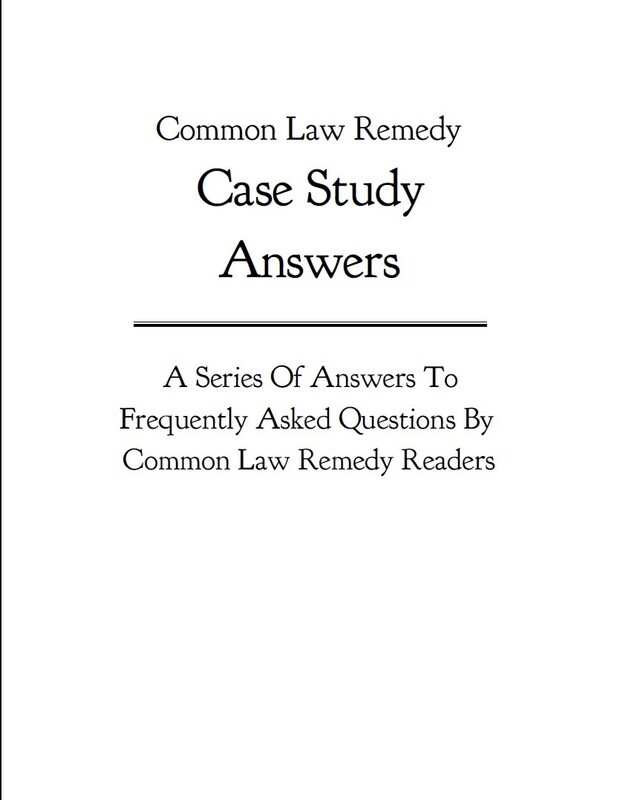 The one thing that most readers who have read the Common Law Remedy free report do not have is valid anecdotal evidence of how the process is can be effectively asserted in reality. And while the How To Handle The Five Scenarios is meant to help readers recognize the mistakes they can make in waging their process, Case Study Answers takes this knowledge to a new and deeper level of awareness by analyzing actual cases sent in by subscribers. The anecdotal evidence presented in the over six-hundred pages of Case Study Answers is meant to answer most, if not all, the questions that readers may have about holding onto the position they take in executing the refusal for cause process. You cannot abandon your position and then expect to prevail. Understanding the maxims of law can assist one in seeking for answers which clarify a matter. For instance, there is a maxim of law which reads: “Fictions arise from the law, and not law from fictions.” Well, taking that on its face value under one interpretation, it would seem that since the State is a fiction, it should have little or no authority to make or pass “law” on natural people. What gives the state a right unilaterally to do such a thing? How can a fictitious state make and pass law that men and women must answer to? The short answer is: it cannot. At least not without the consent of the people and proof of that consent placed on the record. The State does not exist within the natural world, and therefore must be subservient to its creator, the mind of men. If you know how equity remedies differ from law remedies, then you can begin to make some sense of the statement in Bouvier’s dictionary. Historically the law in courts of equity allow for remedies which compelperformance (generally involving corporations and other such commercial creations of the mind), whereas the common law does not. A compelled performance is coercion in the world of men and women. What has occurred is that the state has usurped the people’s courts, and replaced the common law which had been handed down by oral tradition from generation to generation with the state’s Roman civil court tribunals which allow penal fines (compelled equitable financial penalties) for code violations based on the “person” (a commercial entity) named being a surety for the debt represented by the fine. This is why, if you become caught up in the legal system and forced to attend court, you must demand to be heard in a court of record, which is by definition a common law court. But even then, do not be fooled. There are government courts which call themselves a “court of record,” yet which in reality are nothing more than inferior courts which keep a record, but are not considered a legitimate court of record according to a time honored definition. If you do not know how to call them on their bluff by defining the terms you use, you will end up becoming a victim of their Star Chamber proceeding. And sometimes, even then, you may not always fair well because the court itself was dishonorable (meaning corrupt). There’s nothing that anyone can do about a dishonorable court except to figure out how to hold it accountable. Subscribers who wish to deepen their knowledge of law and how to correctly determine what the facts are in any given situation without making the mistake of admitting their consent to the matter will be able to find a wealth of information being disclosed in Case Study Answers. In a true court of law, reason is king. Careful readers should be able to intuit from the answers provided in the case studies examined how to correctly reason and handle the precise situation inquired about. Since all actual law is based upon reason, the skill that subscribers develop in their ability to distinquish the true meaning of events using actual reason will be invaluable in their ability to contemplate the law as it applies to their specific circumstance. Case Study Answers will provide readers with the kind of real world information and knowledge they need in order to seek and obtain remedy from the color of law process being claimed by their opponent. Are you aware that traffic tickets are a form of a bill of attainder or a writ of assistance? Do you know what the significance of these two instruments is, and how they are dealt with by the U. S. Constitution? Why you do not want to enter a court under special appearance or make any appearance at all (if at all possible) in a private administrative law court. An appearance allows the jurisdiction being asserted by the plaintiff. Why you want to preempt the arraignment process with your refusal for cause before the judge can raise it by asking for a plea to the alleged charge. What steps to take to compel a reluctant court clerk to file your documents (the refusal for cause) into the case once the clerk has refused to do so. You can call him (or her) on their bluff by making a simple demand. How to define a “court of record” when making your demand to be heard in one. Know the four essential elements that make up the definition of a court of record, and why a court using statutes is disqualified. Know what a court is. Do you know the elements that make up a court? If not, you could be allowing the state to declare the relevant issues surrounding a matter by not rebutting their presumptions and getting your objection on the record. Know the correct context for and how to correct or reverse a judge’s ruling using a common law writ. There is just one caveat to this, however, you have to be the plaintiff in a court of record under a counterclaim to do this. Get your copy of Case Study Answers as a free complement to the How To Handle The Five Scenarios ebook. Subscribers who haven’t yet offered a gratuity for the Five Scenarios ebook can obtain the Case Study book as a stand-alone. The origin for Case Study Answers arose from a need to further educate subscribers regarding the pitfalls of holding onto their process in the face of increasing non-recognition by the system. State and local governments have been taking a harder line stand against recognizing anyone other than a person representing a legal fiction. As a result, in some instances, it is becoming more difficult for subscribers to determine how to approach this development. What used to be effective against the fraudulent element in government courts is still effective, yet the courts seem to be stiffening their resistance in the pursuit of their plunder of the public. Unless subscribers understand the underlying elements of law at play and what is actually taking place without being disclosed in court, they stand virtually little chance in holding onto the position and status they take when using the refused for cause process. That is, unless they know how to call the court on its act and expose and disqualify the undisclosed presumptions the court is using to legally steal their wealth. You must be aware that the System’s whole ploy revolves around getting you into a courtroom so that the magistrate (the man or woman in the black robe claiming to be the judge) can obtain your consent to administer their political society’s law upon you. The game is rigged, in other words. If you are not aware of how their “game” is being played, you could fall headlong into their trap. Arm yourself with the knowledge you need to mount a legitimate defense, and do your best to stay out of their courtrooms. Case Study Answers can be ordered as a separate stand-alone ebook. But only if you haven’t ordered How To Handle The Five Scenarios or the Discount package (which includes the Five Scenarios ebook). This book was published as a supplement to the Five Scenarios book to help subscribers answer practical questions that arise from having implemented the refusal for cause process.